I must confess I haven't actually played a castlevania title since the late 80's but when I saw this build I knew that a) Jerac is back! b) I want to dust off my emulator and hit the retro trail! I don't know the creatures name but he comes from the game Aria of Sorrow. As usual this Boss starts off as your average Joe, a fireballing guy in a suit but after a good whipping and a healthy stomp or two he morphs into this flying behemoth. 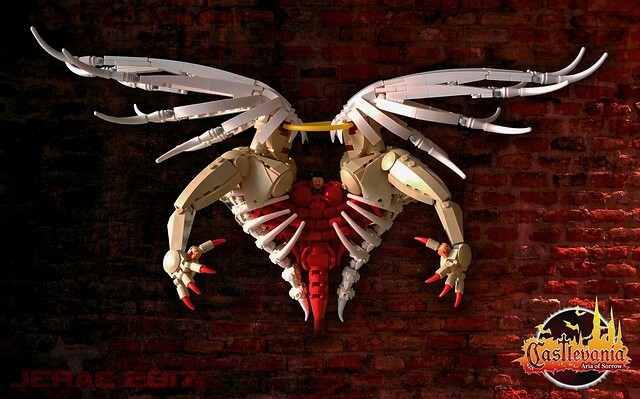 There is so much to enjoy about this MOC, the body shaping, flowing hair and bone work topped off with those vibrant red entrails and a bang tidy edit to boot! Welcome back Jerac I for one have missed you!